When you bring up Blockbuster Video these days, you can’t help but think about where Netflix is now. It's worth remembering, with the dealth of H. Wayne Huizenga, who built Blockbuster Entertainment into a big business in the late 1980s/early '90s. He eventually sold the business to Viacom in 1994 in a $8.4 billion deal, long before Netflix became a thing. Blockbuster did well early on and then pretty much declined steadily. Viacom sold the company in 2004. Blockbuster filed for bankruptcy in 2010 and stopped in November 2013. Netflix started in 1997 — three years after the Blockbuster-Viacom deal. It had nowhere near the marketplace strength of Blockbuster, which rented DVDs/video tapes via stores; Netflix did it by mail order. A key intersection between the two occurred in 2000, when Blockbuster began losing revenue. Back then, Netflix wasn’t doing all that well either. Netflix CEO Reed Hastings approached Blockbuster CEO John Antioco. Hastings wanted Blockbuster to buy Netflix for $50 million. Netflix was a "very small niche business," according to Antioco in Variety. No matter; Netflix went on. In 2007, Netflix expanded its business with the introduction of a streaming service, while retaining its mail-order rental service. Blockbuster also started a small streaming business that year, as well as running a DVD rentals business through its stores. 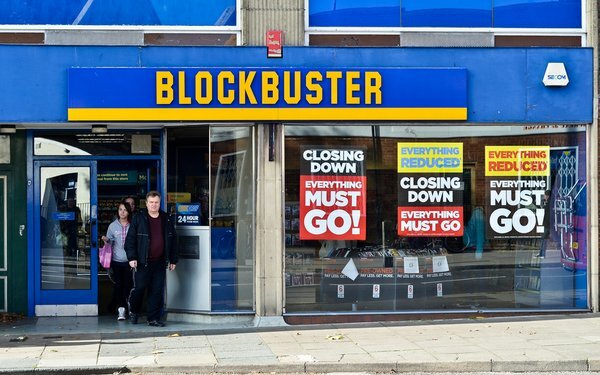 Blockbuster tried a number of streaming services, but nothing took. For instance, in 2011, it started Blockbuster Movie Pass with Dish Network. For $10 per month, members would have access to both a streaming service, movies and games-by-mail. But the package was only available for subscribers of Dish Network's pay-TV service. And it flopped. It is hard to say what would have happened had Huizenga held on to Blockbuster — and whether he would have had the wherewithal to make the leap into streaming video that Netflix did in early 2011. "Wayne was a true video-industry pioneer," the Entertainment Merchants Association said in a recent statement. Sure -- a pioneer. But what about a media futurist? We’ll never know. Now — in the same breath — we could talk about Friendster and MySpace — vis-à-vis Facebook. Where did they go wrong? Lessons learned here? People who don’t learn from history — even media history — are destined to repeat it. In other words: Avoid the low-level TV rerun; think new original stuff. Have a vision. 1 comment about "Could Blockbuster Video Have Been Netflix?". Michael Greeson from TDG, March 27, 2018 at 1:26 p.m. In TDG's earliest days, I met personally with the Antioco and Blockbuster's chief marketing and legal officers, high up in their Dallas skyscraper. They were proud to talk about their new DVD by mail service, even showing of their in-store stand-ups that promoted its availability. I reminded them that they hardly innovative in this move, but responding to Netflix's success, which by then was putting a big dent in Blockbuster's revenue. I then explained to them the future was streaming video over home broadband connections and shared my forecasts. If they didn't move quickly, I said that Netflix would best them yet again. Antioco was so upset that I questioned his team's brilliance that he had us 'escorted' from the top floor of their Dallas headquarters. After that day, I covered the brick by brick demise of Blockbuster with a certain satisfaction. They were told that the future of home video would be broadband streaming and refused to listen.